Vryhof, a trusted partner to many of the offshore industry’s leading players, and its business unit Deep Sea Mooring (DSM), a leading provider of offshore mooring services, has launched a new engineering unit to support the company’s offshore oil & gas, renewables and aquaculture operations across the globe. The new unit, which is just one element of Vryhof that also includes anchoring technology specialists Vryhof Anchors and Moorlink, a provider of mobile and permanent mooring solutions, will be home to some of the industry’s leading engineers with previous experience as oil & gas operators, rig owners and vessel designers. The unit will provide expertise in hydrodynamic and vessel motion analysis; advanced mooring analysis (including for offshore wind turbines and offshore fish farms); dynamic positioning (DP) analysis; flexible and rigid riser analysis; complex marine operations (including offshore crane operations and subsea operations); and probabilistic and deterministic stability analysis for all ship types and floating structures. A main element of the new unit’s activities and a key differentiator in the marketplace will be one of the industry’s largest servers with parallel processing capabilities. This will enable Vryhof and DSM to carry out 120 simultaneous engineering simulations, thereby shortening computational times, reducing assumptions and simplifications, and delivering highly accurate and less conservative engineering analysis for customers. “At a time when engineering innovation is so important to operators as a means of increasing efficiencies and managing costs, access to many of the foremost technical and engineering minds in the mooring industry is a definite value-add for our customers. The result will be viable engineering solutions and highly accurate information and analysis for real-life challenges,” adds Wandl. 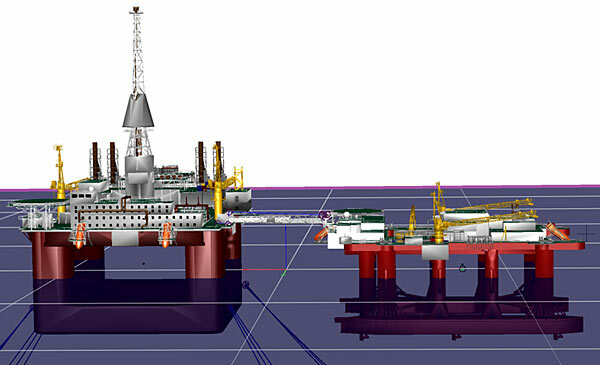 One recent engineering project and a key area of innovation at Vryhof and DSM is availability and forecast response analysis to facilitate the link-up of floating offshore accommodation platforms (known as “flotels”) to their main rigs. In one North Sea application, availability analysis provided by DSM saw the input of hindcast data – over 50 years of historical weather data – in order to estimate the expected availability of the flotel at a specific location. Working with Storm Geo, a global provider of decision support for weather sensitive operations, DSM combined state-of-the art hydrodynamic software and weather forecasts to forecast gangway motion, maximise availability, reduce risk, and optimise operations.